Dr. Clarkson, Dr. Newell, and Staff recently worked together with the Vietnam Veterans Association to make holiday donation to the Hampton VA Medical Center. For more information on how you can support the Hampton VA Medical Center please visit here. 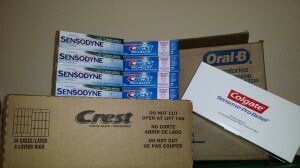 This entry was posted in Community by Dental Staff. Bookmark the permalink.